When looking for the perfect presentation of the Motown sound and style, few fit the bill as well as Martha Reeves & the Vandellas. It was 1963 when they moved from being Marvin Gaye’s original backup singers (“Stubborn Kind of Fellow,” “Pride & Joy,” “Hitch Hike”) to stars in their own right with the trifecta of “Come and Get These Memories,” “Heat Wave,” and “Quicksand.” Over the next decade, Martha Reeves & the Vandellas would be a consistent presence on the music charts, as well as on television and top venues across the US and abroad. With the unmistakable voice that helped define “the sound of young America,” Reeves reigns as one of music’s most beloved and acclaimed female singers. 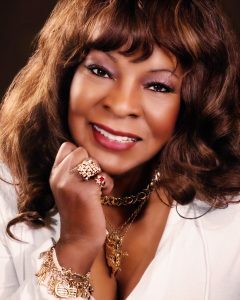 As one reviewer recently exclaimed, “Martha Reeves is the ultimate Motown diva with soul flowing from the tips of her toes to the last hair on her head. They don’t make ‘em like that anymore.” Reeves and her Vandellas remain in high demand, heating up clubs, casinos, concert stages, colleges and music festivals across the globe. Reeves soon become an invaluable administrator, interacting with musicians and performers, scheduling sessions, and making sure that business was taken care of. And she waited her turn to sing. One day, when Mary Wells was unavailable for a session, Martha stepped up to the mic, got notice and a contract. She left the A/R department to become one of Motown’s most enduring and beloved stars. She has counted talents as diverse as James Brown and Beverly Sills among her singing partners. Robin Williams spun “Nowhere to Run” in Good Morning, Vietnam. Her version of Van Morrison’s “Wild Night” was featured on the Thelma and Louise movie soundtrack. The boys of The Boys In the Band and Whoopi Goldberg in Sister Act 2 partied to “Heat Wave.” Everyone from Mick Jagger and David Bowie, the Mamas and the Papas, Dusty Springfield and the Grateful Dead have gone “Dancing In the Street.” Singers such as Adele, the late Amy Winehouse, Florence Welch and Jennifer Hudson sing her praises. Moving beyond the confines of the concert stage, Reeves starred in a US tour of the Tony-winning “Ain’t Misbehavin’”, and has performed in road shows of “The Jackie Wilson Story” and “Good Black Don’t Crack.” She co-starred for three seasons in the UK stage review “Dancing in the Street,” alongside peers like the late Edwin Starr, Mary Wilson, and Freda Payne. Following Starr’s death in 2003, Reeves held the spotlight alone. That same year, she made her opera debut singing with the Motor City Lyric Opera.